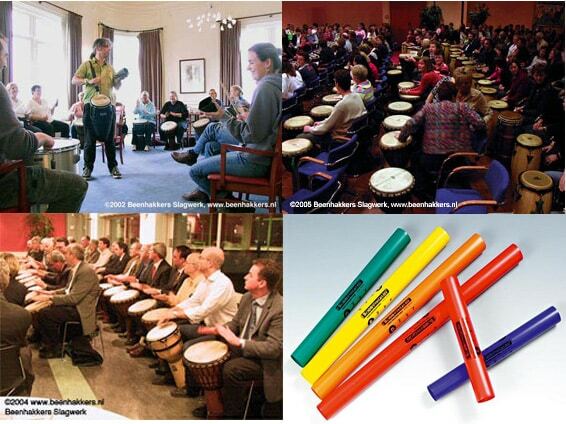 Drumcircle-workshops, Energizers, Happenings and Boomwhackers in English. 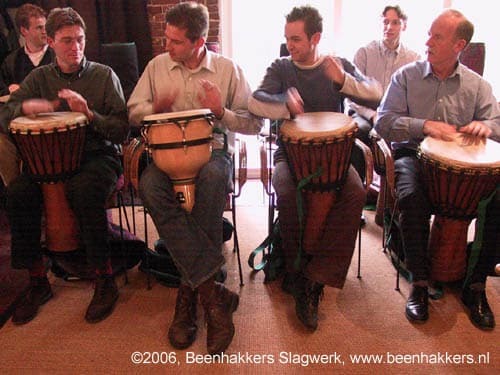 For community-building, team-building, conferences, celebrations, fun, by Beenhakkers Percussion. Inspiring cooperation, creativity, communication and change, through the exhilarating experience of hands-on music making. For any group, any occasion, any reason. Any where, any time, in any way! A Drumcircle-workshop, Energizer or Happening always fits in. 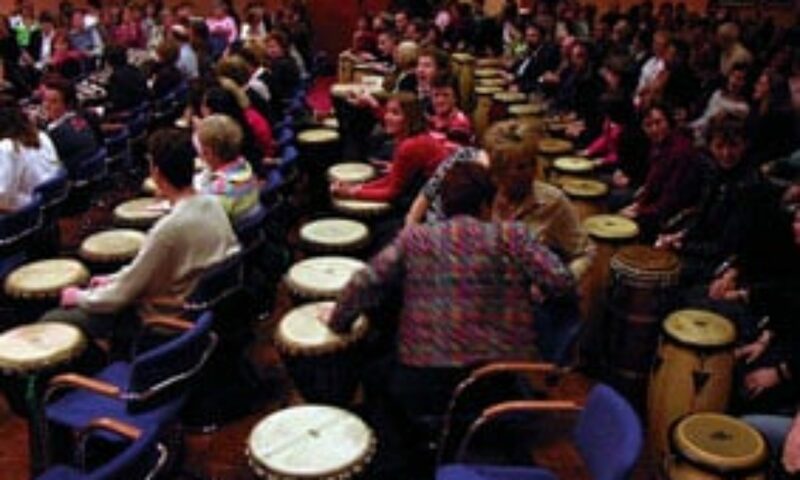 Beenhakkers Percussion offers various programs. They are all suited for many different occasions: a corporate conference energiser, meeting icebreaker, break-out, away day activity, or a team building exercise. The programs can be for fun, serious or both. Each program has it’s own accents and qualities. All programs have lots of humour and community building. And lota of music and drumming of course :-). The rhythm is already in you! 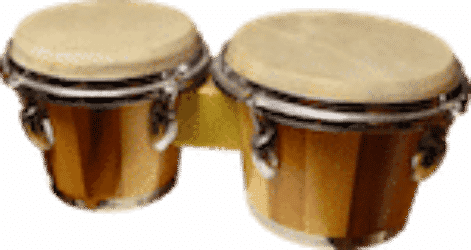 You don’t have to learn rhythm, you just have to discover it: your personal rhythms, how to listen, how to focus, and how to interact with the other team-mates. A facilitated drumcircle-workshop is all about dis-covering and fun, not about learning. Longer program with various percussion instruments. Within the group everybody creates his/her own rhythm. The facilitator guides the group and gives directions in HOW to play, not WHAT to play. In that way the group learns how to create together an in-the-moment rhythm. Everyone can explore end express their rhythms in any form that works for them. Looking for, and sharing things that connects you with the others. Not what separates you from the others. Looking for similarities instead of differences. The focus is therefore on connection, contact, relationship, sharing, exploration, respect and community building. Focus within Energizers is on energy, humour, fun activity and team-building. Fun and humoristic energizers with boomwhackers: coloured plastic tubes you whack on your hand. For all kind of groups, 15 up to a thousand, 15-45 minutes. The group is directed into easy-to-play rhythms that gives the group an energetic boost of making music together. A hilarious Energizer is possible with household gloves (ClappyHappy), and a physical Energizer with Bodypercussion (You are the Rhytm and the Drum). Happenings are more relaxed and even more fun. Various work-forms from the different energizers are combines into a flexible, multi-purpose program that will fit any needs. The Happenings can be done with Boomwhackers, ClappyHappy, Body-Percussion, Bucket-Drumming, Voice or Schuhplattler. Medium program with 3-4 types drums and percussion instruments, eg. djembes, bass-drums and bells. Each instrument-group gets their drum-parts from the facilitator, who guides the group step-for-step, to playing a simple musical arrangement under his guidance. In a workshop percussion, several formats and instruments are combined to make a fun and cooperative music session. Suited for all kind of groups and locations, as well for training as for fun. Accent is on activity, listening, and cooperation. For more information, bookings or questions go to the English contact-page . You can also look on the Collected English Pages page. Some more English articles on drumcircles, percussion and drumming from Beenhakkers Percussion are available at beenhakkers.blogspot.nl.